You know the advantages of the public cloud, like cost-effectiveness and better innovation capabilities. Up to now, companies in highly regulated industries – like healthcare, banking, and the public sector – have had to do without those benefits due to data protection, privacy or sovereignty constraints. Oracle is changing all that with Oracle Cloud at Customer. You get the Oracle Cloud in your datacenter and behind your firewall – it’s a subscription-based service installed and managed by Oracle. You maintain full control over your data while benefiting from maximum flexibility. 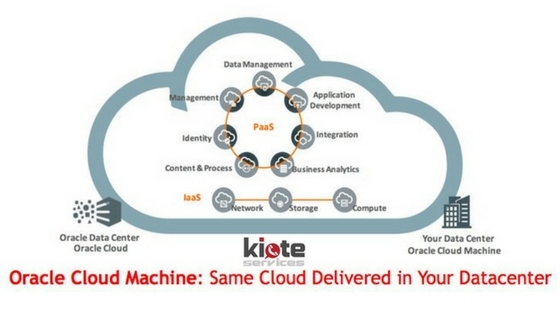 With Oracle Cloud at Customer, you have complete control over where you run your workloads. You can keep sensitive data behind your firewall to comply with legal and regulatory requirements. You can also conduct your dev/test operations in the public cloud and move them back on-premises when you’re ready to go into production. The technology platform is the same in both cases, enabling you to move workloads back and forth with no changes. Oracle Cloud Machine delivers cloud SaaS, PaaS and IaaS services from Oracle Cloud Machine to Oracle and non-Oracle applications and databases in your datacenter. Platform support and change management services are included in the subscription and managed by Oracle via the Oracle Advanced Support Gateway. Oracle Big Data Cloud Machine delivers the power of Hadoop and Spark as a secure, automated, high-performance service in your own datacenter. It can be fully integrated with existing enterprise data in Oracle Database and Oracle Applications.